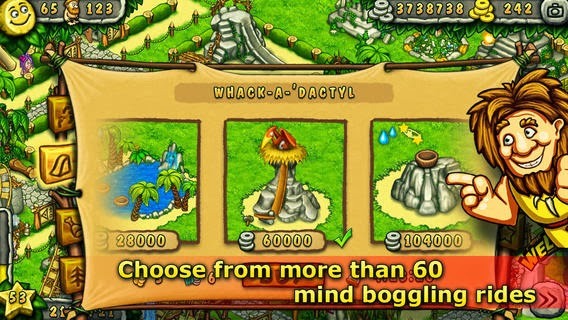 Developer Quote: "Build an incredible prehistoric theme park and become an amusement tycoon of the Stone Age! 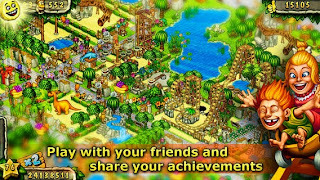 Take up the call of the primeval past and enter the world of crazy prehistoric rides, attractions and roller coasters in Prehistoric Park Builder - FREE Theme Park Simulator In The Stone Age!" I still remember my first visit a zillion years go to Expo, Montreal's amazing theme park. No, I'm not going to put any time stamp here as that will surely date me! Nonetheless, this was before the advent of Disney World. But that first park... Wow, I had never seen anything like it. Never experienced the rush of adrenaline, the sticky taste of cotton candy, screaming and then feeling sick afterwards on the roller coaster ride! Theme parks are just plain cool. They hold a mystique and allure for all ages. There are rides, attractions, food and souvenirs for everyone from Baby Victoria to Grandpa Jeff. So it's no wonder that Prehistoric Park Builder - FREE Theme Park Simulator In The Stone Age holds such excitement for everyone! Yes, it's back in the dinosaur age, but hey there's a lot to be said for the fun, happening stuff that went on then! - Choose from more than 60 mind boggling attractions and rides: giant wooden swings, trampolines made from mammoth hide, giddy merry-go-rounds, stone slides, extreme roller coasters, water rapids and even dinomotors powered by real huge dinosaurs to make all these rides run! 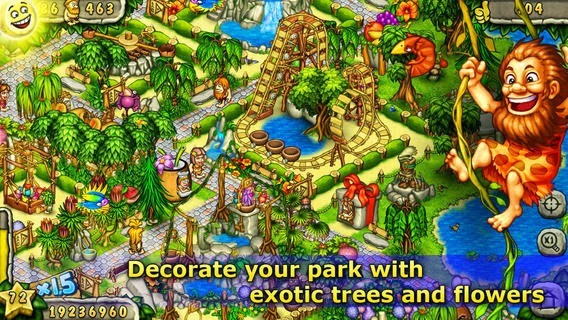 - Decorate your theme park with exotic trees, unique flowers, pagan totems and stone temples. - Build snack bars, drinking fountains, balloon stands and restrooms around the park to meet your customers' needs. - Build cozy rest areas and place benches around for your visitors to feel comfortable in your wonderful park. - Offer your guests a fruit cocktail, cook them a great kabob and treat them with the first ice cream ever created. - Hire workers - they will keep your park running and take care of visitors when you are not in the game. 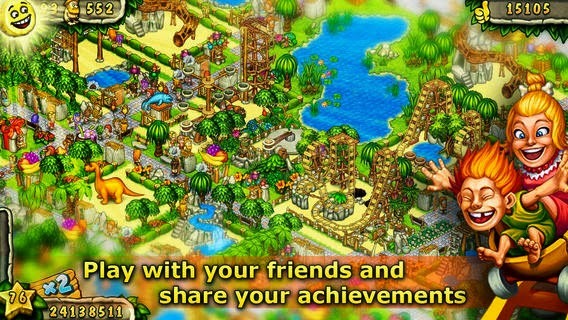 - Play with your friends and share your achievements! Compete with them to build the best amusement park! If you have not played any games yet from the GearGames group, then you are in for a treat! Launch the app, and enjoy your first look at prehistoric times. First off, you must set your language (to English, French, German, etc. if that is your choice) by tapping the gear wheel and following the instructions. Once that's accomplished, you will progress through this game by earning money, buying stuff, and building up the park that you have always dreamed of! Watch the flying dinosaurs flit across the screen. You'll see the Welcome sign and a lot of green pasture - because that is where you will build the fantastic park! The onscreen instructions provides tips and ideas on just how to create your very own theme park. Tap the various grey stones to find the people and services you'll need. 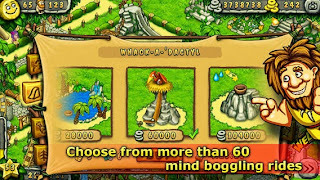 Tap the 3-brick button to purchase trees and plants of all types by buying gold coins. Now tap the cup button to hire people to work for you such as a barmen, mechanics, builders, and also a Santa Claus, mechanics and plumbers! Talk about a booming job economy! Invite friends to play by tapping that button and so forth. See your earnings and points earned on the top of the screen. (Lots of in-app purchases of gold coins are available for you to make your park a thing of wonder!) Also, more importantly, the smiling face on top left reflects the happiness of your guests at the park. Make sure you keep that face happy! At any time, take a pic of your park design so you can send it to your friends! So what's your favorite part of a theme park? The food, the rides, or the games? You can enjoy some wacky rides at your park such as a stone or wooden chute and a hedge maze. It doesn't stop there though. You can add other rides into your creative mix such as a ferris wheel, dino slide and my favorite - Whack-A-Dactyl! Remember... this is the stone age! Get creative and slip back in the zone! What about some food and beverages for hungry and thirsty guests? Oh, there's lots of goodies to choose from. What about fruit cocktail or a drink from the soda fountain? Many more options including a balloon stand for little Dino are available! If you have ever dreamed of being the owner of your kingdom, here's a good place to start! 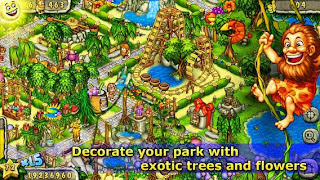 Spunky, sharp visuals and loads of options with which to build a first-rate park is what you'll find with Prehistoric Park Builder! 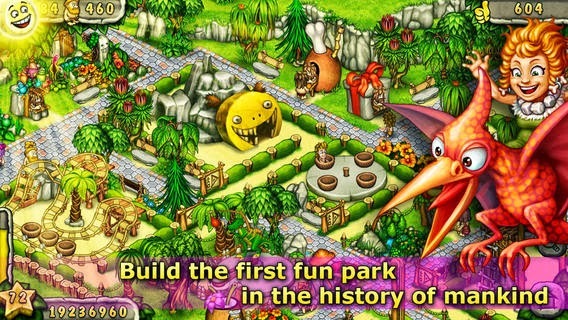 COOL CONCLUSION: Take a long, enjoyable walk into the past expanding your career as a builder and providing entertainment galore for visitors to Prehistoric Park Builder! --iOS/Age Rating: This app requires iOS 6.1 or later. Rated 4+. --Device: Compatible with iPhone, iPad, and iPod touch. This app is optimized for iPhone 5.